A new month, a new year, a truckload of carbs. Welcome to the January Baking Challenge where I’m teaching you how to make homemade bagels with only a few basic ingredients and kitchen tools. This is the year when you’re going to tackle any fears of yeast and bread baking– and I’m right here to guide you along! Here’s a video to guide you along the process. The 1st step is to make the bagel dough. This is the same dough you use for everything bagels, a recipe already published on my blog. There’s only 5 ingredients. Warm Water: Liquid for the dough. Yeast: Allows the dough to rise. I recommend an instant or active dry yeast. Bread Flour: A high protein flour is necessary for bagels. We want a dense and chewy texture, not soft and airy like cinnamon rolls. Bread flour is the only solution! 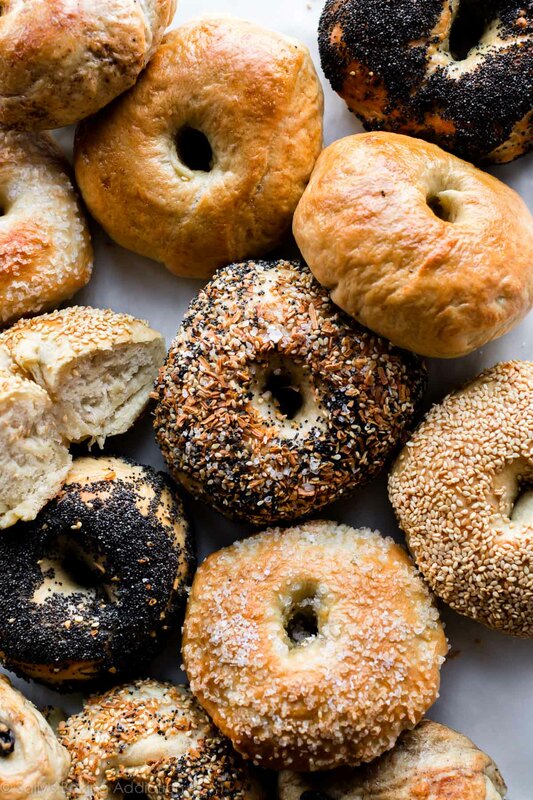 Brown Sugar: Bakeries use barley malt syrup to sweeten the bagel dough– it can be a little difficult to find, but brown sugar is a fine substitute. Notice how there is no fat? This is called a lean dough. Lean dough is ideal for dense loaves of bread. Sweet bread, such as cinnamon rolls, include fat for richness and flavor. You can prepare the dough with a mixer or by hand. Kneading the dough by hand is imperative. Bagel dough is very heavy and dense, which could rattle your mixer too much. You’ll only knead for a few minutes and you can watch me do it in the video above. After the dough is kneaded, let it rise for 60-90 minutes. Punch it down, then divide into 8 sections and shape into bagels. Shaping bagels is easier than it looks. Poke your finger through the center of the ball of dough, then use 2 fingers to widen the hole to about 1.5 – 2 inches. That’s it! I don’t really do anything fancy and the bagels don’t need to be perfect. Mine never are! 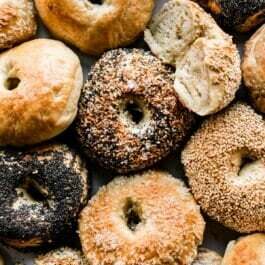 Bagels must cook for 1 minute on each side in a pot of boiling water. This is actually the most important step in the whole recipe. Why? Boiling the bagels gives the bagel its beautiful shine. But looks aren’t everything– this shine is actually a result of the dough’s starches gelatinizing which creates a crisp, shiny coating. I learned this from Cooks Illustrated. Boiling bagels cooks the outer layer of dough, which guarantees they’ll hold their shape in the oven. Add honey or barley malt syrup to the water bath. Why? The sugar adds extra caramelization and crisp. Brushing the boiled bagels with egg wash does the same. Don’t skip either! Plain Bagels: Follow the recipe below. 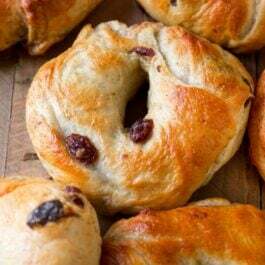 Cinnamon Raisin Bagels: Follow my cinnamon raisin bagels recipe. Everything Bagels: Follow my everything bagels recipe. 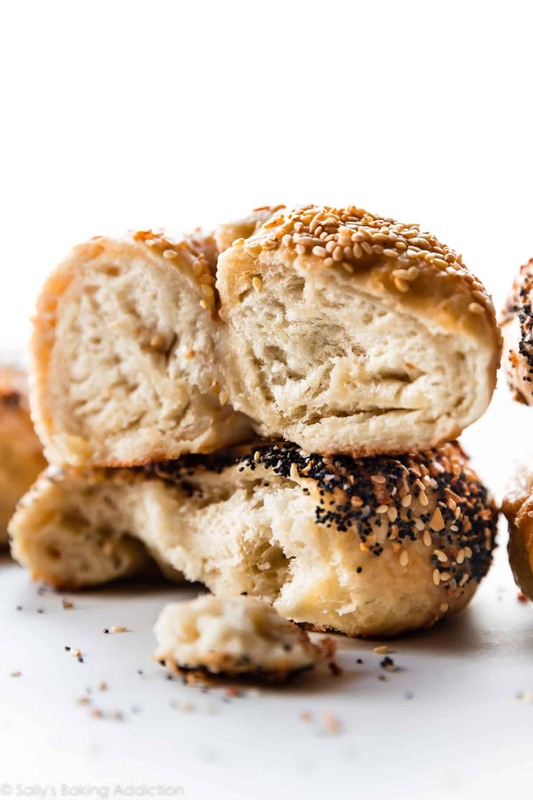 Sesame Seed Bagels: Use 1/3 cup sesame seeds. After brushing with egg wash in step 9, top with or dunk each bagel into topping. Use more as needed. 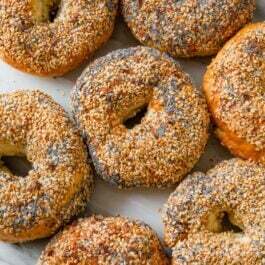 Poppy Seed Bagels: Use 1/3 cup poppy seeds. After brushing with egg wash in step 9, top with or dunk each bagel into topping. Use more as needed. Salt Bagels: Use 1/3 cup coarse salt. After brushing with egg wash in step 9, top with or dunk each bagel into topping. These are pretty salty, so feel free to go lighter on the salt. Cheese Bagels (Asiago, Cheddar, etc): Add 1/2 cup of shredded cheese to the dough when you add the flour. After brushing with egg wash in step 9, sprinkle with extra cheese. Some readers have used this bagel recipe to make whole wheat bagels by replacing half of the bread flour with whole wheat flour. I haven’t tried it, but let me know if you do! 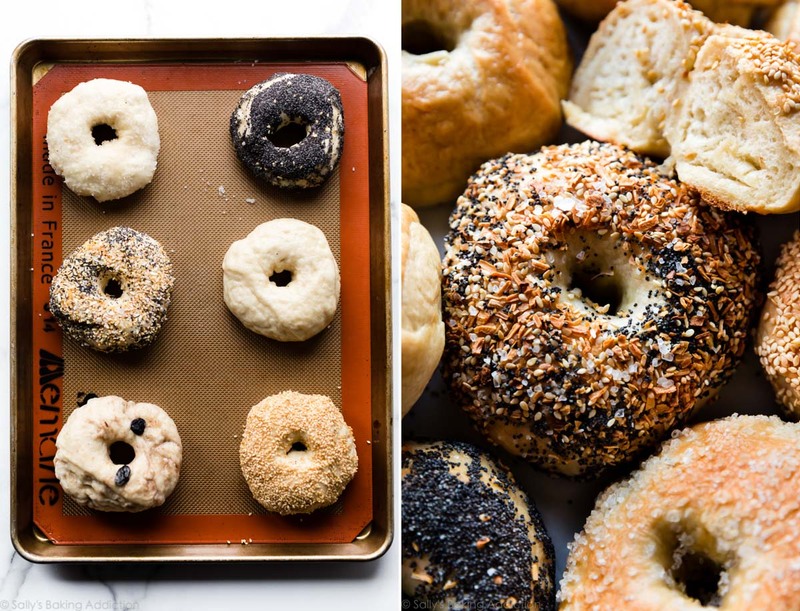 Bake a batch of homemade bagels. You can make any flavor listed. 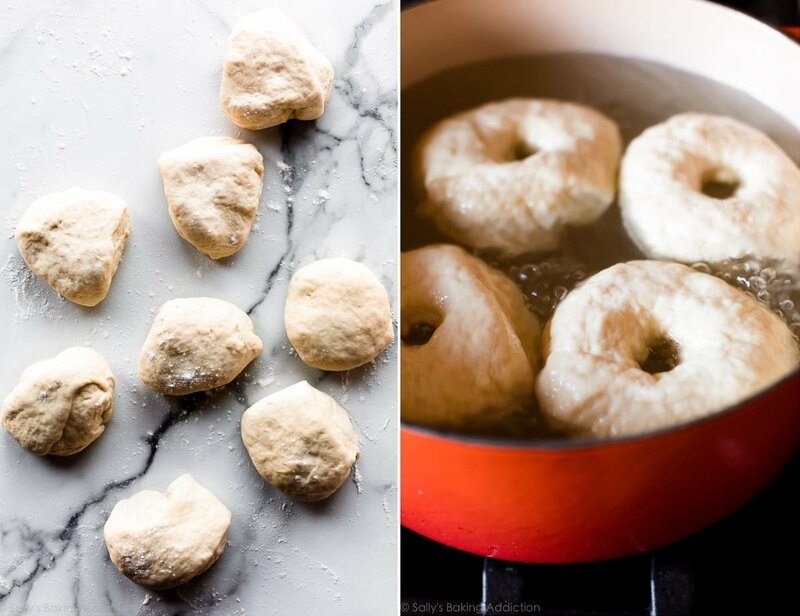 After you make the homemade bagels or alternate recipe, share your photos throughout the month using #sallysbakingchallenge on your public Instagram or Twitter account. Or upload a photo to my Facebook page or Facebook group. Or email it to me. By sharing or emailing your photo, you’re automatically entered in the $250 giveaway! 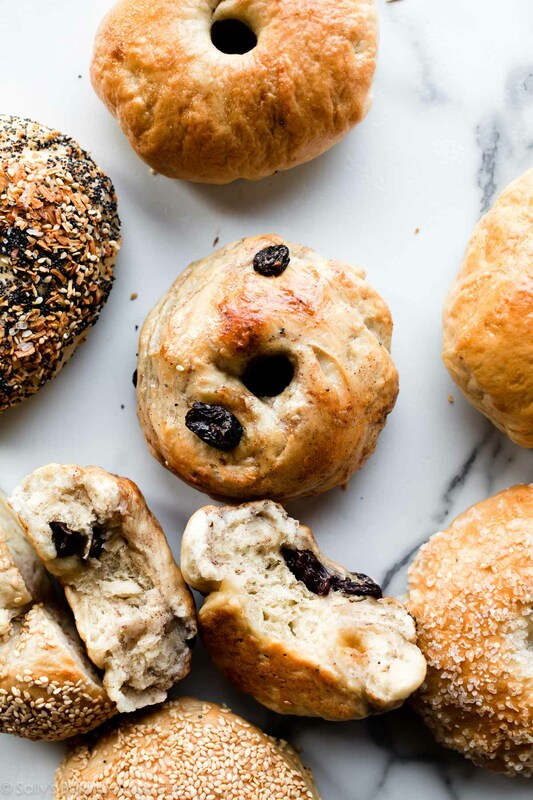 Make fresh bagels right at home with this tested dough recipe. Don’t skip the water bath and egg wash– both provide an extra chewy and golden brown crust. 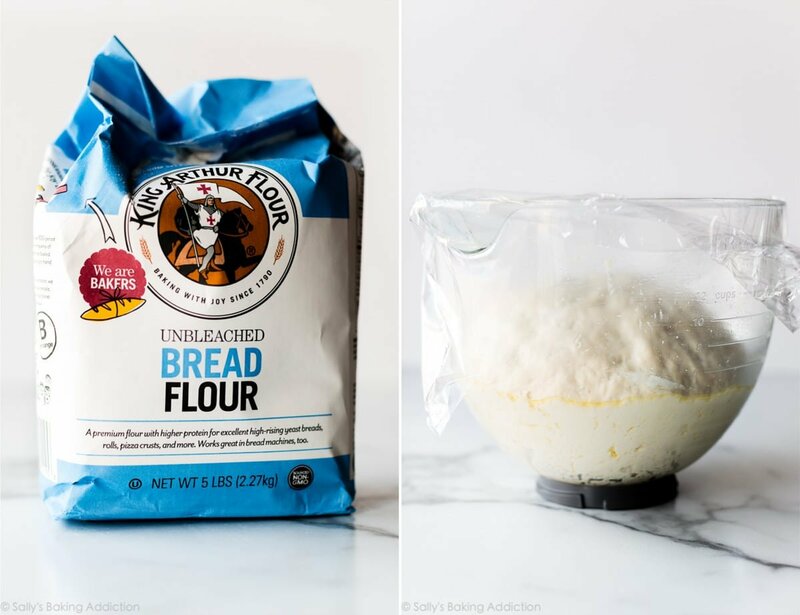 Prepare the dough: Whisk the warm water and yeast together in the bowl of your stand mixer fitted with a dough hook attachment. Cover and allow to sit for 5 minutes. Add the flour, brown sugar, and salt. Beat on low speed for 2 minutes. The dough is very stiff and will look somewhat dry. Turn the dough out onto a lightly floured surface. With lightly floured hands, knead the dough for 4-5 minutes. The dough is too heavy for the mixer to knead it! Lightly grease a large bowl with oil or nonstick spray. Place the dough in the bowl, turning it to coat all sides in the oil. Cover the bowl with aluminum foil, plastic wrap, or a clean kitchen towel. Allow the dough to rise at room temperature for 60-90 minutes or until double in size. Line two large baking sheets with parchment paper or silicone baking mats. Shape the bagels: When the dough is ready, punch it down to release any air bubbles. Divide the dough into 8 equal pieces. (Just eyeball it– doesn’t need to be perfect!) Shape each piece into a ball. Press your index finger through the center of each ball to make a hole about 1.5 – 2 inches in diameter. Watch video above for a visual. Loosely cover the shaped bagels with kitchen towel and rest for a few minutes as you prepare the water bath. Water bath: Fill a large, wide pot with 2 quarts of water. Whisk in the honey. Bring water to a boil, then reduce heat to medium-high. Drop bagels in, 2-4 at a time, making sure they have enough room to float around. Cook the bagels for 1 minute on each side. 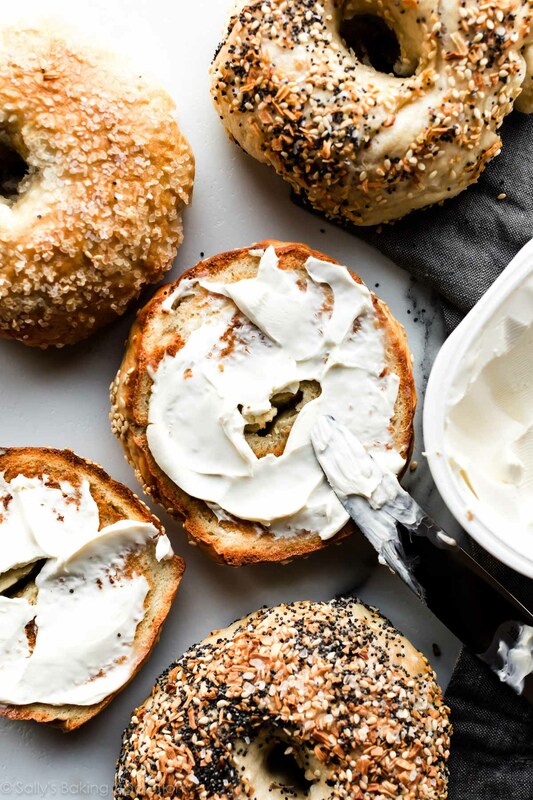 Using a pastry brush, brush the egg wash on top and around the sides of each bagel. Place 4 bagels onto each lined baking sheet. Bake for 20-25 minutes, rotating the pan halfway through. You want the bagels to be a dark golden brown. Remove from the oven and allow bagels to cool on the baking sheets for 20 minutes, then transfer to a wire rack to cool completely. Slice, toast, top, whatever you want! Cover leftover bagels tightly and store at room temperature for a few days or in the refrigerator for up to 1 week. Overnight Make Ahead Instructions: Prepare the dough through step 4, allowing the dough to rise overnight in the refrigerator. The slow rise gives the bagels wonderful flavor! In the morning, remove the dough from the refrigerator and let the dough rise for 45 minutes at room temperature. Continue with step 5. I don’t recommend shaping the bagels the night before as they may puff up too much overnight. Freezing Make Ahead Instructions: Baked bagels freeze wonderfully! Freeze them for up to 3 months, thaw overnight in the refrigerator or at room temperature, then warm to your liking. You can also freeze the bagel dough. After punching down the dough in step 6, wrap the dough tightly in plastic wrap, then a layer of aluminum foil. Freeze for up to 3 months. Thaw overnight in the refrigerator, then punch the dough down again to release any air bubbles. Continue with the rest of step 6. Special Tools: stand mixer fitted with a dough hook attachment, large baking sheets (I love these), big pot (I use my 5.5 quart dutch oven), pastry brush. Yeast: Use instant or active dry yeast. If using active dry yeast, the rise time may be up to 2 hours. 1 standard packet is about 2 and 1/4 teaspoons, so you will need a little more than 1 packet of yeast. Bread Flour: Bagels require a high protein flour. Bread flour is a must. Here are all my recipes using bread flour if you want more recipes to use it up! Barley Malt Syrup: This ingredient can be a little hard to find, but truly gives bagels that traditional malty flavor we all know and love. Most natural food stores carry it. I offer alternatives such as brown sugar in the dough and honey in the water bath; I’ve made bagels with these alternatives AND with barley malt syrup and honestly love both versions. By Hand: If you do not have a mixer, you can mix the dough together in a large bowl then knead by hand for 10-15 minutes. Bagel Varieties: See blog post above for various add-ins and toppings. Note that the toppings are added after the egg wash in step 9. Some readers have used this bagel recipe to make whole wheat bagels by replacing half of the bread flour with whole wheat flour. I haven’t tried it, but let me know if you do!